Does this photo terrify you? I get the willies just looking at it. 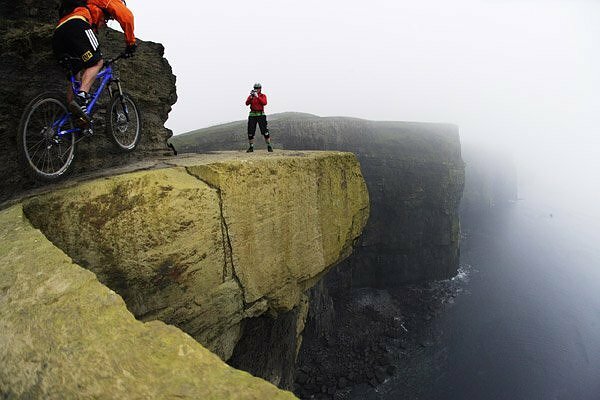 I wouldn't want to walk there much less ride my mountain bike. Take note that his wheels are not on the ground. And that "ground" is only a narrow ledge. These are the Cliffs of Mohan where one false move sends you 600 feet to the Irish rocks & Atlantic waves below. Crazies - that is riders - exult in "riding the edge." Navigating the terrifying treachery of this trail includes jumping four foot gaps & riding along four inch ledges. I question if they are riding the edge of sanity. Flashback nearly 2000 years from Irish Cliffs to dusty Nazareth. Mark 6:1-6. Jesus goes back to his hometown synagogue the first time as a Rabbi. He is initially welcomed. Miracle making, powerful preaching rock star of his day. Yet, familiarity with "the carpenter" & contempt for "Mary's son" with no mention of his earthly father allowed his hometown crowd to label & dismiss him. Mark 6:5 offers terrifying truth, "He could not do any miracles there except lay his hands on a few sick people." The previous chapter plus, Mark 4:35-5:43, delivers a potent story trio with one purpose: displaying Jesus' awesome power. Jesus' power over nature, 4:35-41, calming the storm. Jesus' power over evil, 5:1-20, casting out the legion of demons. And 5:21-43, Jesus' power over sickness & death. Yet, here in his own hometown we learn the power of unbelief. Mark 6:5 is one of the boldest statements of the Gospels. It tells us something Jesus will not to. Jesus is God in flesh. Omnipotent. He CAN do anything. Yet Jesus chooses to limit his limitless power in accordance with the faith of people. Mark 6:6 reports of Jesus, "And he was amazed at their lack of faith." The only other time Jesus is said to be amazed in the Bible is by the faith of the Centurion who believed Jesus could heal his sick servant from a distance by word alone (Luke 7:9). Yet, the LACK of faith in his hometown amazes him. What do you think God can't do? He can't change me. I'll have this habit forever. He can't change them. They will always be that way. He can't change the situation. I shouldn't even pray about it. Do you realize that your lack of faith may be THE very reason he has not changed "it" whatever it is? You have power to stop the very thing that you need. You hold the keys to terrifying power. The power of unbelief. Confess. Repent. Ask for faith. May we live by faith fearing only of the holiness of God with no fear of our own faithlessness.